Ciao bella! This year's Lavazza Italian Film Festival hits Brisbane from 3-21 October, bringing almost 30 gorgeous Italian movies to the Palace Centro and Barracks cinemas. The Italian Film Festival is the last of the big foreign film festivals to visit Brisbane this year (following the Spanish Film Festival and Russian Film Festival). It's a fitting climax, offering a great mix of comedy, drama, and romance, including numerous award-winners. Among these is Magnificent Presence, which won best director and actor at this year's Italian Golden Globes. I caught a preview screening of this movie, and it was intriguing, to say the least. An aspiring actor moves into a dilapidated mansion in downtown Rome, only to find that it's haunted by an entire theatre troupe from the 1940s. He struggles to manage not just the ghosts who sit down to dinner with him each night, but his inability to find acting work or a boyfriend to keep him company in his new home. Throw in the mystery that surrounds the vaudevillian ghosts and you have a charming movie that's more kooky than spooky and definitely surprising in its twists and turns. On a more serious note, this year's festival also features a number of films that explore the complexities of immigration and refugees -- an issue that's confronting not just Australia but much of the developed world. Down There: A Criminal Education, is the gritty tale of African immigrant Yussouf trying to survive in a southern Italy dominated by the mafia. Islands is a beautiful drama that traces the relationship between undocumented emigre worker Ivan and a young mute woman who tries to help him. Shun Li and the Poet explores the life of a young Chinese woman trying to bring her son to Italy to join her, while Things from Another World uses humour to reflect on the essential role that immigrant workers play in many western nations. There are also plenty of romances, including the Australian premiere of Woody Allen's latest movie. If you're wondering why Allen's work makes it into an Italian film festival, well, it's called To Rome with Love and presents four vignettes based on different couples and their tribulations in the city of love. Featuring Alec Baldwin, Roberto Begnini, Judy Davis and Allen himself, it's bound to attract attention. There are crime movies, political thrillers, and even a documentary about the 'lost' soccer world cup of World War II. For a full rundown, visit the festival website and check out the program yourself. It's a rare opportunity to see a wonderful collection of films, many of which are Australian premieres and most of which won't screen anywhere else in Brisbane. 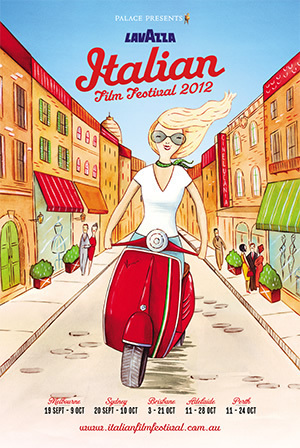 If you'd like to go in the draw to win a free double pass to the festival, email me at competitions@weekendnotes.com, with 'Lavazza Italian Film Festival' in the subject line. Tell me which cinemas are screening the festival, and include your postal address so that we can post you your passes if you win. The competition closes midnight Sunday 23 September. Buona fortuna!